Francisca Viveros Barradas (born April 2, 1947) known professionally as Paquita la del Barrio ("Paquita from the hood") is a Mexican singer, songwriter, and actress. She is a Grammy nominated singer of rancheras and other Mexican genres. Paquita started her career in Mexico City in 1970. She performed at a local restaurant in Colonia Guerrero, where fans returned every week to listen to her music. It is here where she gained her stage name. Her big break came in 1986, where she performed in a Televisa show that exposed her to a bigger audience and led to a recording contract with CBS. Her songs usually take a stance against Mexico's sexist male culture. This has made her popular among female audiences. She is known for her often confrontational presence; her signature phrase, with which she often teases male spectators in her shows, is "¿Me estás oyendo, inútil?" ("Are you listening to me, you good-for-nothing?"). Her best-known song is "Rata de dos patas" (Eng: "Two-legged rat"), in which she compares an ex-lover to a variety of vermin and other untrustworthy animals. The song was included in her album of the same name. Many of Paquita's albums and songs are jukebox staples in Mexican clubs and cantinas. Many admirers, particularly outside Mexico, also appreciate her for her camp value. Paquita duets with singer Ricardo Arjona on "Ni Tu Ni Yo" on his album 5to Piso (2008). She also performed at the Premios Lo Nuestro and participated in the "Somos El Mundo" the Spanish version of "We Are The World." She was honored with the lifetime achievement prize at the Premio lo Nuestro awards (2016). She was born in Alto Lucero, Veracruz. Her first marriage ended when she discovered her husband was married to another woman. Her second marriage lasted 31 years, and ended with her husband's death in 2000. She was criticized by the LGBT community when she said in an interview, "It is better for orphans to die than to be adopted by a homosexual family." She then apologized to the LGBT community and did a special performance and a press conference in a gay club called Spartacus Disco. 2004. Me Estás Oyendo, Inútil? ^ "2011 - 54th Annual GRAMMY Awards Nominees And Winners: Latin Field". The Recording Academy. November 30, 2011. ^ a b González, Edurne Uriarte, Carolina. "Paquita la del Barrio: Diary of a mad Mexican woman". nydailynews.com. Retrieved 2019-03-01. ^ Vargas, Deborah R.. Dissonant Divas in Chicana Music : The Limits of La Onda. Minneapolis: University of Minnesota Press, 2012. Accessed March 10, 2018. ProQuest Ebook Central. ^ "Rata de Dos Patas - album by Paquita la del Barrio on Apple Music". Apple Music. January 16, 2012. Retrieved 16 January 2019. ^ "CCCCD Libraries". 0-go.galegroup.com.library.4cd.edu. Retrieved 2017-05-04. ^ Chaves, Katherine (17 January 2015). "Paquita la del Barrio: 'Nunca estaré del lado de los hombres'". La nacion. Retrieved 16 January 2019. ^ Medina, Mekahlo. "Gay Parents or Death? Famed Latino Singer Picks Death". NBC Southern California. Retrieved 2019-03-01. 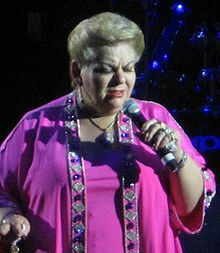 ^ "Paquita announces show at gay disco to apologize for adoption comments". LA Times Blogs - La Plaza. 2010-03-19. Retrieved 2019-03-01. ^ Molina, Raúl de (2010-06-06). "Paquita From the Hood". Huffington Post. Retrieved 2019-03-01.